Queen Maraya is the wife of High King Emeric, and the daughter of King Fahara'jad. Her marriage to the High King was instrumental in forging the Daggerfall Covenant. She can usually be found in the throne room with a book in her hand, reading or conversing with her husband. "All visitors are welcome to Wayrest. If the Daggerfall Covenant is to succeed, we must all respect one another. The king and I are of one mind on this matter." "My father and I were both deeply saddened to hear of my sister's death. I understand you made the call to execute her murderer. You made the right choice, and I thank you for it." What happened to Lakana was a tragedy. "My sister was always headstrong. She chose Duke Nathaniel, and she wouldn't take no for an answer, They were on a state visit when we met the king and the duke. My wedding was first, followed by hers. Now Lakana is dead, and the Covenant is shaken." "My husband and I must travel to Alik'r to Speak to King Fahara'jad, my father. We will return my sister to her birthplace: Sentinel. We'll keep the Daggerfall Covenant strong. Lakana wouldn't want her death to imperil all we've worked for." After saving her husband from the Night Terror"
"The threat to my husband was a threat to the Daggerfall Covenant as a whole. On behalf of my father, King Fahara'jad, and all of Alik'r, I thank you." High King Emeric: "No, no … I think you look wonderful, and very thin … very skeletal, which is why I like … skeletal. Your jewelry hangs cute." Queen Maraya: "Honey, please, we must go see my father. It's been so long." High King Emeric: "Maraya, I promise you, we'll visit your father as soon as possible … maybe not this year, but next year … for sure." High King Emeric: "This throne is arguably the most uncomfortable piece of furniture in the kingdom and I get to use it." Queen Maraya: "Darling please, we can have it cushioned if you like." Queen Maraya: "Oh my good little boy here, are you going to come sleep with mama tonight?" High King Emeric: "I'm sorry darling, but I'm not sleeping with that in the bedchamber." Queen Maraya: "Oh, but he loves to sleep with us. Don't worry, he'll be no trouble at all. Come on, darling. Please." Though she is not truly there, a nightmare form of her exists in Emeric's dream where she angrily regrets marrying the King. High King Emeric: "Maraya...I don't understand. I know we wed for political reasons, but I thought that over the years you actually came to … I thought you loved me. If I've lost your support, then I have lost everything." After Shornhelm is freed from enemy forces, Maraya can be found in Shornhelm Castle, having traveled there with her husband. "It is a relief to know that the city is safe. If time allows, I will go out into the streets and try to help the people rebuild. It is the least I can do. And to be honest, I can make more of a difference out there than in here." Queen Maraya can be found in the throne room once the Doomcrag has been dealt with, waiting for King Emeric to choose a new ruler for Rivenspire. "I think Countess Tamrith and Baron Dorell both could be excellent rulers. The important thing that we crown someone. And today must be the day." 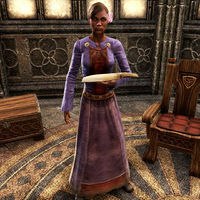 After the new ruler of Rivenspire has been crowned, Maraya has a favor to ask of you. "Today is a fortuitous day indeed for Rivenspire, though I fear other kingdoms within the Covenant may not be so lucky. I know that my husband considers you to be his champion, but I wonder if you might be willing to assist his queen as well." Of course, Your Majesty. How can I help? "I have heard troubling news from Sentinel. Rumors say that enemies from my father's past have returned. I wrote to him right away, of course, but as everyone knows … King Fahara'jad can be slow to respond. Still, I fear for his safety." Who are these enemies from King Fahara'jad's past? "Necromancers. Their kind has not been seen in the Alik'r desert for years, but that only makes them more dangerous. If you can go to Sentinel and just ensure all is well, it would be a relief. I have made travel arrangements, if you are willing." Of course. Just tell me where to go. "Look for a ship called the Dawn Posset offshore at Northpoint. The first mate, Elvira Derre, should be waiting for you on the docks, ready to leave for Sentinel. When you get there, just make sure the city is safe. Only visit my father if you wish." Can I ask a question before I go? Maraya can be asked furthers questions about the situation. "Of course. I am relieved already, just knowing that you will go. If there is any trouble there, I know father could use help, whether he wants it or not. I'm sorry. I digress. You said you have a question?" Can you tell me more about the necromancers? "When I was very young, there was a necromancer...Suturah. He raised an army of the dead and marched on Sentinel. Though my people will not fight the dead, somehow my father won the battle. If Suturah has returned, though, it would be very bad." The people of the Alik'r desert won't fight undead? "No. It is a matter of faith. Our people believe that desecrating the dead, even if they have been risen, is a terrible dishonor. This is why a necromancer in Sentinel would be a very bad thing, and why I am concerned for my father's safety." Is King Emeric not concerned about a threat in Sentinel? "My husband has many admirable qualities, and one of them is a hopeless optimism. He rarely takes action until a problem has at least been confirmed. As I said, I have only heard rumors of trouble in the Alik'r. Hopefully, it is nothing." You're originally from the Alik'r desert? "Of course. My father is King Fahara'jad. My brother Azah, my sister Lakana, and I were raised in Sentinel. Then one day my father told me he had to marry me to this mad, young king of Wayrest, Emeric. I was furious of course, but I came around." After The Parley is completed, Queen Maraya will appear in Evermore Castle along with her husband. "My heart goes out to Arzhela. I admire her strength in shouldering so much responsibility in the wake of so much tragedy. I look forward to seeing King Eamond and the children avenged." This page was last modified on 23 December 2018, at 22:11.